Crossing Guard Appreciation Day - May 7, 2013! Crossing Guards are a critical part of keeping streets safe! May 7 is Crossing Guard Appreciation Day! 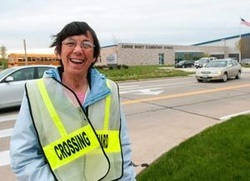 SAVOY — When it comes to enforcing the rules of school traffic at Carrie Busey Elementary, crossing guard Susan Bolin is friendly, but firm. She even set Principal Jeff Scott straight, when he recently forgot the road in front of the school allows only northbound traffic during the school day. Bolin yelled to keep him from turning the wrong way out of the school's parking lot, Scott said. Bolin's job is crucial, Scott said, because most of the school's students live north of the intersection of Prairie Rose Lane and Sunflower Street, where Bolin watches three crosswalks before and after school. In the mornings, all the cars dropping students off drive north through the intersection, as do all the school's buses. Read more! C-U SRTS Project has created a Crossing Guard Appreciation program to recognize the hard work adults in our community do to help ensure the safety of our children getting to and from school. Schools in Champaign-Urbana can nominate their crossing guard for this appreciation program. Winners are selected each month through the year and receive a Certificate of Appreciation and a gift card to a local restaurant.